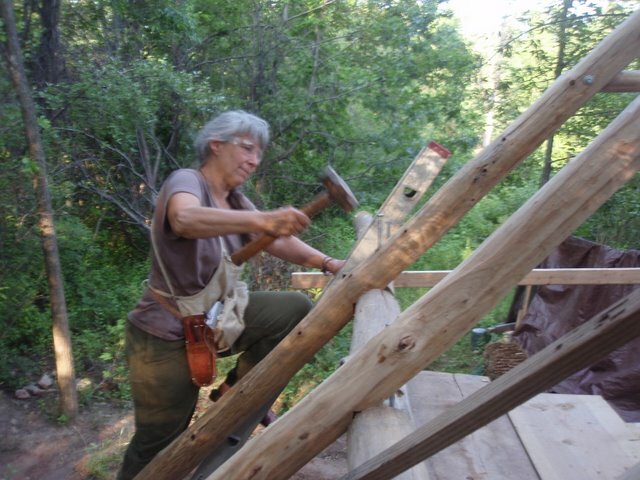 I entered the world of natural building by participating in a “Start-to-Finish” course with the Cob Cottage Company in 1996 after retiring from teaching art & sustainability at the middle school level. Returning to Michigan, I became a collaborator in the Strawbale Studio Project. I now educate (and learn) as much as I can about natural building & sustainable living through workshops, internships, presentations, exhibits & outreach. I had the privilege of illustrating the Hand-Sculpted House Book, The Natural Plaster Book, and The Cobber’s Companion, and being a start-to-finish collaborator on the Kensington Kids Cottage, located within the Kensington Metropark, at the Farm Center. Especially life-changing were my adventures during 1979 & 1980 when I recieved a Masters Degree in Social Ecology from Goddard College in Vermont. 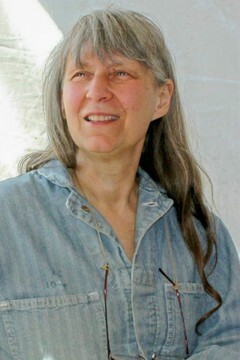 I have been exploring Sustainability, Appropriate Technology & Design with Nature over the years, in my work with Upland Hills Ecological Awareness Center, Oxford, Michigan, and through my activities in natural building & other natural living skills. Now is a time of networking, sharing, coming together to envision & create. I am so thankful for this journey. I began my journey into natural building officially in 1996 with a 3 week building course with the Cob Cottage Company. 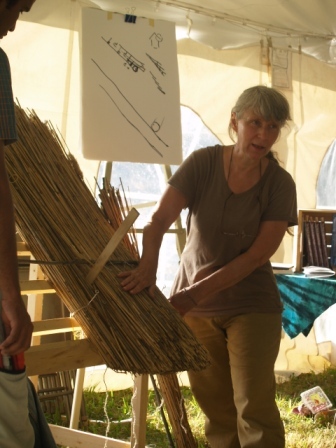 Since then I have attended workshops on strawbale construction, light clay construction & earthen floors with Robert LaPorte, and many Natural Building Colloquium where I have been privileged to observe and learn from wonderful masters in the field. Since 1996, and my retirement from public school teaching, my lifework has been building & educating about strawbale construction, earth plasters and sculptures and thatching. I am continually interested in sustainability, and especially in local, natural, hand-harvested materials. I love foraging for food, natural building materials, and learning the qualities of such natural materials as wool, bees wax, fermentation, felting, and more. I consider myself on the “traditional” end of the spectrum and lean towards indigenous, vernacular architectural techniques, which I am ever weaving into the projects around me. In 1998 I learned basic thatching skills from Danish Master Thatcher, Flemming Abrahamsson, in a 12 day course, and since, have helped to thatch the Strawbale Studio in Oxford Michigan, and directed the thatching on the Kensington Kid’s Cottage at the Farm Center in Kensington Metropark, Milford, Michigan. I have done a lot of reed collecting, and understand the basic principles of design and attachment for Phragmite reed grass roofing system. Although I consider myself a “novice thatcher”, certainly not a master thatcher, I feel confident in showing you how a common person, like you or I can successfully and beautifully thatch a roof with minimal skills. I am a teacher, and a curious person. I find thatched roofs to be very intriguing and enjoy sharing the knowledge I have about it! I have been applying earth plasters since 1999, and have done extensive work with sculpting benches and other Earth Art. I have been asked to do earthen sculpting at the Cob Cottage Company “Heart House” on their outdoor fireplace, and at the ceremonial building at the Peace Weaver Center on Thunder Mountain in Bath, New York. I illustrated the Natural Plaster Book by Cedar Rose Guelberth & Dan Chiras, and brought Cedar Rose to Oxford Michigan, for a 5 day workshop on natural earth plastering. There she learned additional skills in doing both basic and finish plasters. Through workshops, the main house I live in (which has conventional painted drywall walls) is being transformed with earthen plasters and sculpting! It is such a pleasure to be able to teach these skills of natural plastering, sculpting and painting ~ reconnecting and creating with earth elements! How can we use nature around us in as natural a state as possible, with simple hand tools? I do love the battery-powered drill, but still, I am fascinated with how to make what is needed with just a very simple repertoire of skills and a few “easy to come by” or “possible to make” tools. Thus, I study native american architecture books, pioneer and primitive skills, and sometimes modify them to take advantage of the tools that we do currently have available: Draw knife, saw, chisel, bolts. I am fascinated by rawhide lashing and making cordage out of such plants as Dogbane (Indian hemp) in the “Milkweed family, which grows 50 feet from the front door. Come learn, share, explore. And, hey, it’s FUN! “I learned more in this course than I ever expected, and more in this 3 weeks than any other 3 weeks of my life.” Craig D. Natural Cottage Project Participant. “What I learned was not just about natural building, but building community and doing things together.” Scott L.
“Thanks for the great day on Sunday at the Candle Class. I always feel such peace when in your home and land.” Chris H.
“Your Intern Program changed my life so much. I was so motivated after leaving the Studio !” Jimez W.
“The Full Moon Potluck was so wonderful, beautiful, inspiring, and we are excited to return for some classes! I have been sharing my experience there with friends and family and my intentions were ‘reset’ after my visit. Sustainability and earth-conscious living are so important to us. “ Erin P.
“I visited yesterday for the potluck for the first time with my daughters. It was awesome!!! Thanks for living from the heart and creating this example for folks to participate in and learn from. “ Halima C.
“When I am here I feel empowered and relaxed. ” Workshop Participant, and returning helper: Justin P.